The latest DLC for Dead Rising 4. I feel like golf has enough of the shambling nearly-dead on its courses already, but here's a bit of DLC for Dead Rising 4 that makes it explicit. Super Ultra Dead Rising 4 Mini Golf is the latest add-on for Capcom's sandbox zombathlon, and if you hadn't guessed by the name, this one's set on a novelty golf course. The novelty being that it's infested with zombies, the balls are bigger than normal, and you'll be able to play the whole thing in co-op with three friends. "Spring has arrived and the zombie horde has invaded the local fairways and putting greens of Willamette, Colorado," Capcom says. 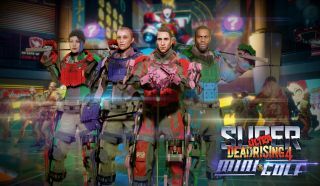 "On June 20, get ready to flip zombies the birdie in Super Ultra Dead Rising 4 Mini Golf, releasing for Xbox One, Windows 10 and Steam. "With oversized golf balls and customizable clubs, players will drive long and hard down the fairways of Willamette in search of the perfect putt. Grab your golf loving friends for 4-player co-op or go solo on the zombie infested course. But watch your score—you definitely don’t want to bogey on this course!" Mini Golf is included in the Dead Rising 4 season pass, but it will be available to purchase separately as well, for $9.99/€9.99/£7.99. What did we think of Dead Rising 4? In his review, Leif Johnson surmised that while it was "much too easy, Dead Rising 4 is sandboxy zombie-killing adventure that recaptures the series' fun".